Nevada is set to become one of the battery capitals of the world as Tesla has made its final decision on the location of its battery gigafactory. It will be located close to Reno, Nevada, and the automaker broke ground at the site in early August. The news was announced at a press conference in Carson City, Nevada. Other sites that were being considered were California, Arizona, New Mexico, and Texas. The factory is estimated to cost $5 billion, will occupy 10 million square feet, and be home to 6,500 jobs. 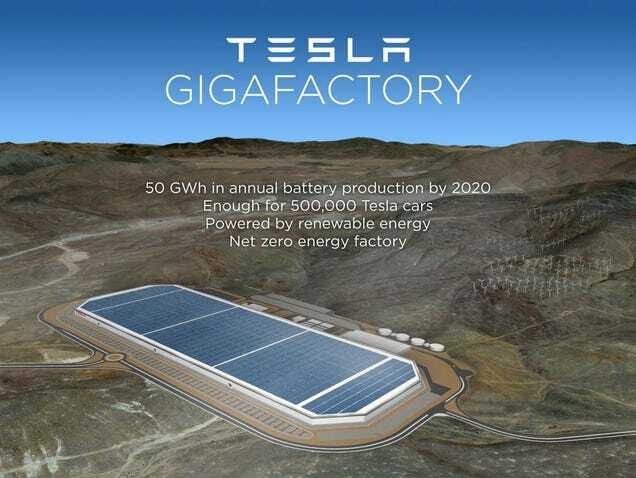 Now that we know where the factory will be built, Tesla has told us quite a bit more information about the gigafactory. The factory will be over 5 million square-feet, will cost $5 billion to build, will employ 3,000 construction workers, 6,500 manufacturing jobs, and is thought to add another 16,000 indirect jobs to the State once the factory is running in 2020. The factory will also run entirely on renewable energy. Another thing to think about is the tax credits given to Tesla by Nevada. Why would they not choose Nevada if they were willing to offer 100% Tax exemptions for 10 years. When completed, the factory may become a tourist attraction, Musk said. "We're going to make sure that people can visit it, come look and check it out, because it will be worth seeing," he said. Other states were also offering incentives to get the factory in their own locales. It was basically a race to the bottom. Should provide a lot of jobs for people. Hopefully Tesla pays them well especially since they are going to get all these tax savings. That's besides the point, Big business is the largets generator of potential tax revenue, and for a state in as bad shape as Nevada the added revenue would be like a tall glass of water after wandering the desert aimlessly. ITs officially official now, the govener signed it into law. In addition, the state will buy Tahoe Reno Industrial Center’s main road, the USA Parkway, for $43 million, and will extend the road to U.S. Highway 50 at a cost yet to be determined. Finally, the legislature had to agree to give Tesla and other EV manufacturers the right to directly sell their wares to customers in Nevada without going through the traditional dealership model. In exchange, Tesla will provide $7.5 million annually to the state for education funding over the next five years beginning in 2018, as well as invest $3.5 billion in manufacturing equipment and real estate in Nevada.